Like most people who often cook from scratch, I have gotten used to peeling and chopping all my own vegetables, making my own dough, and – not to be overlooked – doing lots of dishes! So when I recently decided I’d like to try making a “real food” coleslaw dish, I looked at the green and purple cabbages in the produce section of the supermarket and thought 2 heads of cabbage was an awful lot to buy (and chop up) for one small colorful dish of coleslaw. I asked the produce manager if he could cut the cabbages in half for me when he pointed me in the direction of pre-cut, bagged cabbages just for the purpose of making coleslaw – duh! I am so used to not being able to buy “convenience” food anymore that it didn’t even dawn on me to buy these ingredients pre-cut and ready to go. What a time saver (and a more appropriate amount of food)! And these radishes that are cut into little matchsticks aren’t just limited to coleslaw…they could add a little spice and color to so many dishes! Consider them for green salads, sandwiches, salsas, and more. They come in a resealable bag to help keep them fresh and are starting to appear at some WalMart stores, so be on the look out. Please share your ideas for incorporating these little sticks into recipes below! So while we are being inventive with adding radishes to our coleslaw why not leave the creamy version behind for something with more of an Asian flair? Today I am excited to share this tangy recipe that incorporates a delicious Asian dressing that would honestly be great on any salad. Enjoy! In a large bowl toss together the cole slaw, radish ministicks, green onions, and cilantro. Set aside. In a countertop blender (or using a handheld immersion blender) puree together the soy sauce, honey, vinegar, oil, ginger, lime juice and red pepper. Pour the dressing over the coleslaw mixture and combine until evenly coated. Garnish with toasted sesame seeds (if desired) and serve. Thank you Dandy for introducing me to your product and for sponsoring this post! 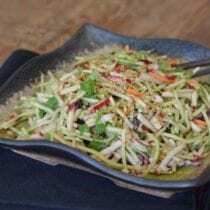 My hubby loves Asian coleslaw. I love the fact that’s REAL. Definitely giving this a try. This looks great! Do you have a recipe for a real food vinegar sauce to make this in a non-Asian variety? I do like the convenience of precut veggies and bagged salads, but I worry that the washing process that they undergo may use chemicals I’d prefer to steer clear of. Do you know? 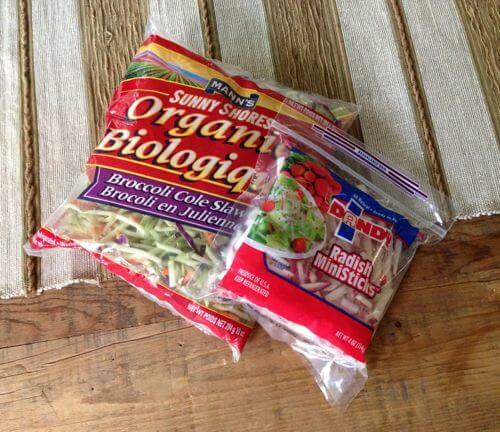 Did you use the broccoli slaw on purpose, or do you think bagged shredded cabbage would work just as well? A note about pre-washed veggies: Wash ithem anyway, organic or regular! I discovered a live cricket in a container of pre-washed, organic baby spinach, and I discovered a dead and moldy fly in a bag of pre-washed organic romaine lettuce. Eww! I make something similar but add fried noodle sticks. Gives a nice textual crunch. Bit like the radish I guess. Great recipe. Great post. I’m so glad you gave radishes a little attention. They look like there’s nothing going on nutritionally, but they’re actually in the same family as cabbage and quite health supportive. I absolutely love vinegar-based slaws. I will definitely try this maybe with some toasted cashews on top! This looks good and fresh. I will try this. Another great way to enjoy radish slices is grilled with a little olive oil then use as a topping on your pizza. My boys really like it this way. PS- I typically do an asparagus, mushroom, radish pizza. Sooo good. Do you know if this company uses pesticides? I didn’t see anywhere on thier site that said their food is organic? Duda Farm Fresh Foods was an early adopter of integrated pest management practices, which uses beneficial insects to naturally reduce plant pests. Since the 1950s, we have used professional, licensed “scouts” and “pest control advisors” to assist our farmers with the judicious application of agricultural chemicals. I am trying to feed my family of 5 real foods on a budget and was wondering what your average grocery bill is each week/month? Any tips would be great!! My youngest son has a soy allergy. 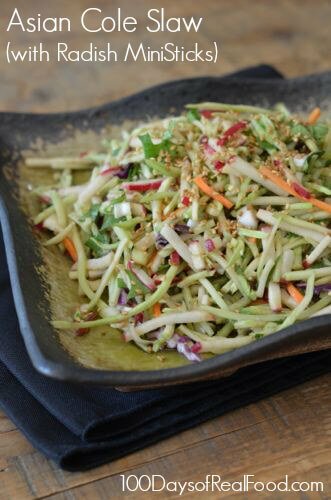 I love this slaw recipe, except for the use of soy sauce. Any ideas for substitutions (or could I just take it out and still have a nice flavor)? Thanks. Tamari sauce is a great substitute for soy, and it’s gluten free. Coconut aminos would work well also. Perfect timing for this recipe, thanks! I just received 2 little cabbages in my veggie delivery today and was wondering what to do with them! Is there an alternative to fresh ginger? Could I use my ginger in my spice cabinet? The idea of peeling and grating ginger is not very appealing! :) Thanks so much! I wash my ginger and throw it in the freezer. Then when I need it I just grate it off…no peeling!! Frozen ginger grates easily and it keeps a long time in the freezer. Fresh ginger is a flavour I love and I wish I could remember who told me this hint because it is great!! Becca, have you tried peeling ginger with a spoon? It works like a charm, and made me less afraid of working with it! Now I just buy it, peel it, and whatever is left, I toss in the freezer to save for next time! I enjoyed this salad a lot. However, the soy sauce was a little overpowering for me. I would cut back the soy perhaps to 2- 1 1/2 TBSP and increase the vinegar. Very refreshing salad. Thanks for sharing! Be Blesssed! Yay, it is nut free! Asian recipes tend to have peanut/tree nut something or other which doesn’t work in our household. Excited to try this. Love cole slaw and have been looking for a recipe without mayonnaise. 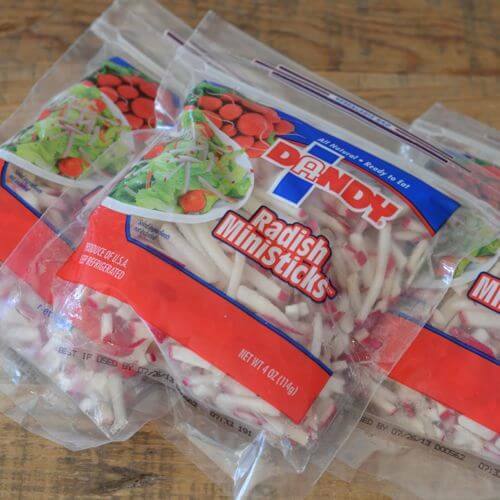 And I love radishes! We made this as a side to your sloppy joe recipe and it was perfect. Hi Lorraine. Look for an organic Tamari soy sauce. This would go really well as a side to your Asian Lettuce Wraps recipe in your 100 Days of Real Food book! I love Pulled Pork and want a creamy mayo recipe that fits that rules that I can use to make a creamy coleslaw! Any ideas anyone? Hi Jenny. 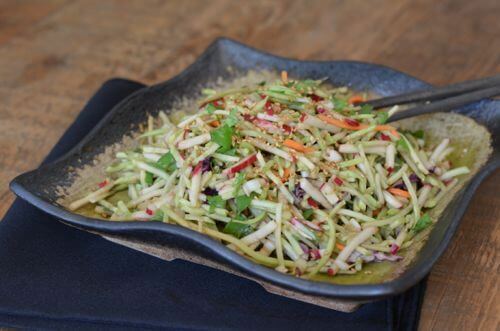 This Asian cole slaw is Lisa’s recipe: https://www.100daysofrealfood.com/?s=asian+slaw. For a creamy version, I really like this recipe: http://www.thesimplemoms.com/2012/07/a-simple-real-food-recipe-coleslaw.html.